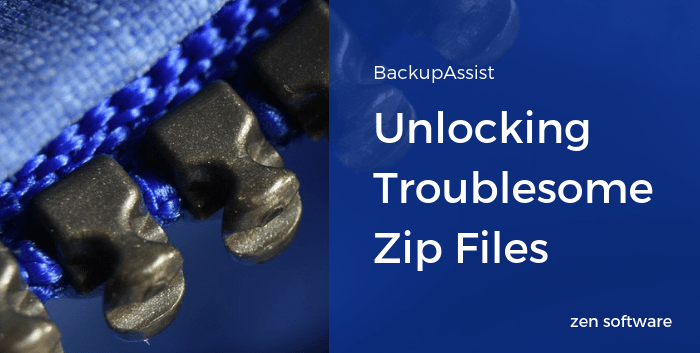 Since the introduction of GDPR and related regulations an increasing number of BackupAssist customers are looking to tighten up security on their backups especially backups using the File Archiving engine by enabling encrypted zip backups. To help meet these requirements the BackupAssist developers have increased the privacy of encrypted File Archiving backups in BackupAssist 10.4. However as a result there has been reports from some partners who have experienced problems restoring from BackupAssist Zip backups. The Developers are working hard to find out what these problems are, and are hoping to fix them in upcoming releases. One common problem seen is that zip backups larger than 4GB cannot be restored using standard Zip 3rd party tools. This means that BackupAssist must be used, which is not ideal in all situations. In order to uncompress thease very large Zip backups you will require a specific version of the 7Zip tool , version 9.20 to be exact.. This is an older version of 7Zip, but fortunately this version is installed with BackupAssist, and so it is available with all BackupAssist installations. Alternatively it can be downloaded from the 7Zip Websiteif needed. Hopefully this tip makes your lives a little easier when working with File Archiving backups. ← Amazon Lightsail – Removing The Last Barrier Between Your Small Business and The Cloud?